Once I started making summer dinner-party food, I couldn’t stop with just a salad (even a really good salad). I had a lengthy barbeque menu just coming out my ears. I know, I should have gotten that looked at… but I felt the best way to deal with that was to get cookin’. What I needed was side dishes, and pronto. I actually only had a couple hours before guests showed up, (remember, this was an impromptu gathering) and it was time to implement a few fast favorites of mine. So I thought, what would Mom do? She is, after all, a veritable home-entertaining rock star – minus the paparazzi – with a playbook of all the best snappy recipes on call in her blonde head. Of course: salsa and potato salad. Um, who doesn’t love those at a barbeque? But unlike your average store bought varieties… well, they’re fresh, and therefore extra delicious + better for you! Like that, with the help of a couple cans of diced tomatoes and canned green chilies, I had a salsa that was quicker and better than making a grocery run for a jar of premade stuff. In a large bowl, mix together all ingredients, adding seasonings at the end: you will need at least ¼ tsp. of each, but will probably want to add more to taste. Here is my suggestion – ¼ tsp. salt, ½ tsp. pepper, ½+ tsp. cumin, 1 tsp. chili powder, ½ tsp. cayenne pepper, ½ tsp. oregano, ½ tsp. onion powder, and ½ tsp. garlic powder. I’m sure I end up adding more of each of these as I go along, but taste-testing always gets it right! Blend about half of this mixture in a blender and add back to the chunky mixture. 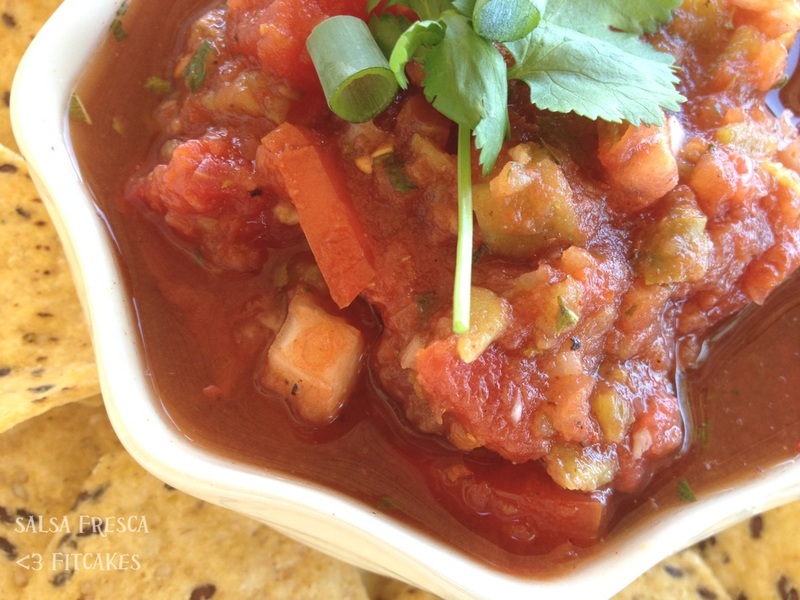 I like a chunkier salsa, but you can always blend more or less to your preference! Serve with your favorite chips, on a salad, or on top of a burger!